I am an over achiever, and definitely a planner, so when pregnant for the first time I asked my OB if there was anything I could do to prepare for my ultrasound. Her response was basically this, “There really isn’t a lot that you can do.” Convinced that she must be mistaken, I searched the web, and my library of pregnancy books. And true to my doctors words, no one had any suggestions. The only information that I could find was some doctors recommended having a full bladder before the scan. This sounded like a wonderful idea to me, so I downed my orange juice. If your doctor suggests this the reason is fairly simple, the liquid in the bladder helps transmit sound waves, and the full bladder can help push the baby in a more favorable position for viewing. My obstetrician didn’t tell me to fill my bladder, or to not pee an hour before the scan but I figured I would do it anyway. I mean, if it helps, great! My wonderful plan was ruined however, when I was asked to give a urine sample right before my scan. And once you start the flow, there is no stopping it. A lot of other moms I know suggested eating something sweet an hour or so before the ultrasound so that the baby was active and willing to move around. This sounded like a wonderful idea to me, so I downed my orange juice. (To aid with my full bladder too!) Turns out my baby was too active to get all the measurements the technician needed. 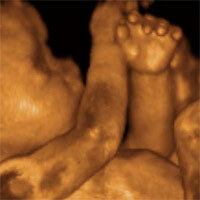 All that being said, to prepare for your ultrasound there really isn’t much you can do. You can ask your doc if they want you to have a full bladder, but besides that you can sit back, relax and enjoy the show!